Wow!!! I am finally back in Singapore. It's our 4th day back and the warmth is definitely a nice change from the cold back in Shanghai. The weather has been good- windy and sunny. Adah even asked me on the first day why I was not dressing her in jackets and socks! LOL! Some blog candy from nice people. 1) Steph is giving away some blog candy to commemorate having 1000 hits on her blog! Click here to check it out. 2) Also Steph is giving away blog candy to celebrate the launch of her blog. How sweet and nice of her! 3) Marlene is celebrating her blogoversary here and she has some yummilicious goodies to give away too. 4) Jeanette is sharing some Stamping Up stamps here. Very generous of her. 5) Crafty Coo is also giving away some candy here. 6) Debby has blog candy for grabs till 30th January. 7)Heather is also giving away some stamps and other craft supplies to celebrate her birthday. But what I really want to say is these people are not just sweet and generous, they are talented designers and their cards make me drool and so want to improve my craft skills. 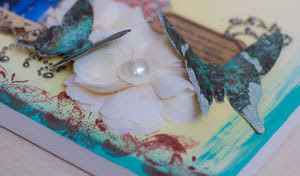 I am ashamed at how shabby my cards pale in comparison to theirs which are made with love and creativity. So check out their blogs for inspiration! This is a layout I did for my girlfriend's new baby using the sketch from Pencil Lines Sketch #118. All babies look so happy and innocent especially when they laugh like that, without any worries, so carefree. Of course, they are still too young to understand. What do they know about the financial crisis that's going on? What do they understand about terrorism? Just gimme my milk and cuddle me! Chensy was a small baby when she was born but she has grown so much and I can't wait to see her and pinch her cute cheeks! A simple card that I put together in half an hour using 2 seperate Unity stamps. I needed a simple card to go along with a gift for my friend's newborn. (Yes, yet another new baby!) And hubby likes to issue last minute requests for my cards. I was packing for our trip back to Singapore last night when he asked for another card. I have lost count of the number of friends giving birth and having new additions to their families in the past 1 year. There are another few more couples I know who are also pregnant. Woo hoo...but even with so many friends I know who are having babies, the figures for Singapore's reproduction rates don't seem to be improving much. Woo hoo!!! Went all bling on this one. I enjoyed myself making this card last night. The challenge is to create a frame on your entry. I just had to complete this one last challenge before we set off for home. All participants get a discount at 7kidstocollege.com! I used a Unity stamp to create the frame and rhinestones to fill up the circles which were part of the stamp's design. I then stamped my favourite Penny Black's character, the hedgie, onto the card and another cardstock which I later cut it out and mounted on the card using foam squares for an elevated look. The rhinestones made the card look so bling and I didn't want to overwhelm the feel of the card, so I found a simple rub-on and added it to the right hand side of the card. Do join in the fun at Penny Black Saturday Challenge! Made this card for Cupcake Craft Weekly Challenge. I wanted a generic card, so no sentiment was used and I will add my own later on in the card once I find an occasion for it. I had in mind when I was putting this card together as a card of encouragement for a friend who just delivered and is facing some stress in handling her baby, but I was contemplating doing a cutesy- welcome- baby- new mum- new life- kind of card for her too. Since I can't decide, the card stays generic. I used my Unity stamps for these- the flowers and the butterfly. I like this sketch a lot as it is easy to piece together and probably will come up with more using this sketch, once I have more time on my hands. I dunno when though, with our upcoming trip, teaching Adah to read, getting Asher to toilet trained and to speak more...I am getting a bit spooked out by the education standards and expectations in Singapore. My hobby may need to take a little back stand now. After all, I am a mother and a wife first before any other indulgences. Back to the card, I like the unity stamps I have used cos u can easily embellish it with a rhinstone or faux pearls or u can even pop out the flower part. The butterfly image was meant to be embossed but I have yet to find a good heat gun that gives me the effect I want. I snipped off the feelers of the butterfly cos I did a terrible job at cutting around them. Sighs...will need more practice here! I made this card using the sketch from Sketch Saturday! I am enjoying stamping more and more and there are so many 'pretti-ful' (In Adah's language, its pretty and beautiful combined together) stamps out there, designed by talented ladies. And since there are so much hearts in my card, it just fits the challenge at Secret Crafter too! So, I'm submitting this for their latest hearts challenge! Elzybell stamps are one of my favourite, and they have just launched a new set for Valentine's Day. I like their stamps except that I find them a bit small. Then, there's whiff of joy, Sugar Nellie (which is only available on funkykits.com only), pink gem designs, etc etc...so a large portion of my scrapbooking expenses now goes to purchasing stamps. I have to control the temptation to just go online, surf and buy now! And I thought being stuck in Shanghai means I will be spending less than my SB friends in Singapore. 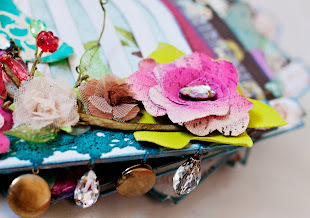 This layout is submitted for Your Scrapbook Stash Birthday Week Challange. I wonder if I am still in time, but it has been a bad week, with Adah sick from last Friday till Tuesday, and then now Asher. I am indeed aging, I remember I used to have the stamina to get up several times to check on the kids when they were babies (even when they started sleeping through the night at 5 weeks), but now when I only have to wake up twice in the night to check on them, I get giddy the next morning. The picture above was one of the first few photos we had of Asher. I was extremely irritated with the business manager of this particular photo studio which was allowed to call on new mothers who had just delivered in the hospital, when I had Adah. She came every morning, as punctual as my gynae to 'encourage' me to take up their package which includes one shot of the newborn. I was pissed off by her persistence but I caved in the end for Adah. With Asher, I wanted to have his photo taken to ensure both kids are treated fairly, but I could not locate her until the day I was due to be discharged!!! Asher was such a sleepy baby then. He could hardly open his eyes. The paediatric nurse had to undress him to the skin to wake him up for breastfeeding, so I wonder how the photographer managed to wake him. His eyes looked so small and barely open in the picture. On a side note, we are due to go back to Singapore for a month!!! Woah...one month back to my sunny island, without the cold and layers of clothing...but without my scrapbooking supplies, so I will be out of action for a month. Maybe more mojo will return after this break. Yippeee!!! The layout I did of Adah titled 'Lil Princess' has been chosen by Lotus Paperie as one of the 3 finalists for December's submissions! This is the first time any of my layouts had gotten this far. Please vote for me if you think mine is the prettiest amongst the three. All you need to do is to click on the poll on the top right hard side of the blog. 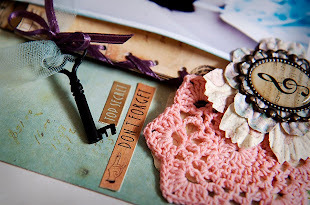 Pink Gem Designs is giving away free stamps! Read about it here. I made a total of 4 cards over the past 3 days. Decided to take a break from scrapbooking and use my stamps instead. But I am still not too good a cardmaker yet, these being my first few attempts. I want to get my stamping technique right first. The first card will be submitted for a Penny Black Stamping Challenge blog that I came across while blog hopping. I am always impressed by the cards that these stampping gals can come up with. I will have to put in more practice before my stamp set arrives from Simon Says Stamp. I can't be on their design team and let them down! The above layout is for One Little Word's first challenge of the year and the word to work around the layout on is, of course as seen in my layout is 'START'. I think I am a 'greedy-for-as-many-pictures-in-my-layout-as possible' kind of scrapper. I know sometimes less is more but all these pictures just hold so many memories and seems to tell the story for me. I had planned on including as many of the scans I had done for Asher and to have them punched out in circles (to represent the baby in the tummy) when I came across Moments Recorded's latest challenge! Hey hey!!! So I tried to work around the challenge requirements as well, and there you have it. Look at just how cute Asher is. The big photo shows Asher during Christmas 2008. He was only 9 months old then and was still learning to crawl on his belly then. One year later, he is now 21 months old and is attending daily school for 3 hours everyday. He is now learning to express himself more and is fast becoming a gangster. Asher put up a performance for his school's mini Christmas concert and to our surprise, he stayed cool and calm without crying through it all, unaffected by the crowd made up of anxious and proud parents/ family of the little ones. I always wanted to do a first year album for both Adah and Asher. Finally I am starting on the album and that was me when I was pregnant with Adah...Special thanks to Sophia who sent me some RAK (prob after reading my ramblings that I can hardly get stuff around here!) Thanks Sophia!!! A little good news to start off the new year! I am on the design team for Simon Says Stamp! Woo hoo!!!! My very first design team call up. I am too happy for words and I dunno if I can shout about it here already! I checked and checked their website and the list of design team members has not yet been released but the e-mail from Heidi and Heather says to go ahead and link to their blog so I am going ahead to publish this entry anyway. I get to choose a stamp from Simon Says Stamp exclusive clear stamps and have to come up with 5 cards/ layouts with it. I have made my choice already and can't wait to start!!! I wonder if I can order some stamps to be shipped together with that set they are sending me. I have been eyeing that Hero Arts Japanese Dolls stamp set for the longest time!!! Will update some layouts soon. Back to bask in my joy...woo hoo!! !